One of the things I love about Lightroom is how fast you can change its look. Why would you want to do that? 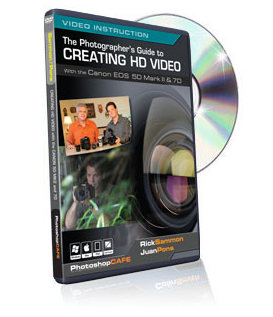 To make an already efficient program even more efficient and adapt it to your needs. 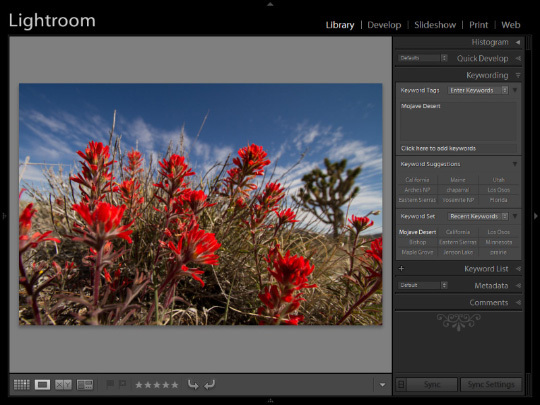 I am going to give you some simple keys to press to change Lightroom quickly (I am going to keep this simple and only give a limited set of keystrokes that consistently help). 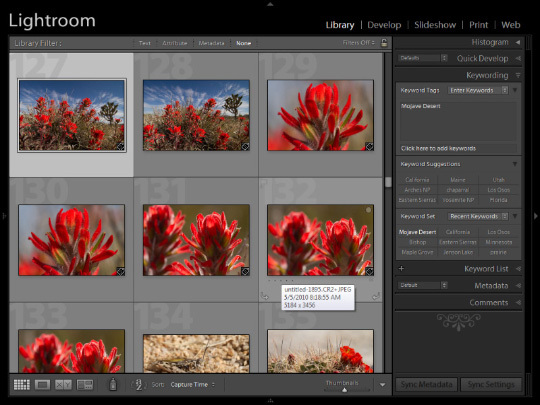 You don’t always need all the panels, so why not simplify the Lightroom interface to focus on what you really need. If you are only working with photos and keywords in Library, you don’t need to clutter the screen with the left panel of folders and collections, or with the filmstrip at the bottom. The function key, F7, closes and opens the left panel (true for all modules) and F6 closes and opens the Filmstrip. Also, you are only pressing a single key. And while you are working in Library — go instantly between the grid and a loupe view by using the letters G (grid — small g is fine, but the capital G is easier to read in this text, so I will continue that convention) and E (for loupe since L is used for lights out to change emphasis on what you see). You can go back and forth as much as you want, then go right to Develop by pressing D. Hit G or E at any time to go back to those screens in Library or D at any time to go to Develop. Note that you only need to press a single key. You do not need to use any modifiers. You can then make that grid or single-image loupe view fill the screen by pressing Shift + Tab — that will remove all panels except the center photo work area. Press Shift + Tab again to go back to all panels. Now suppose you press D and go to Develop. It can be very helpful to see the image as large as possible, so you can usually close the left and bottom panels — again, F7 and F6. However, you might want to examine what you did in the History part of the left panel, and once again, keep the photo as large as possible — then you can press F8 and make the right panel go away (or return). You can also close the top panel with F5 and a toolbar with the letter T.
I am constantly using these keys to adjust the interface to make it work most efficiently for me. I like having a simple interface that is absolutely functional, and these keys help do that quickly and easily. My Lightroom workflow videos cover this and more, plus how to efficiently work with your images in Lightroom from import to processing in Develop. 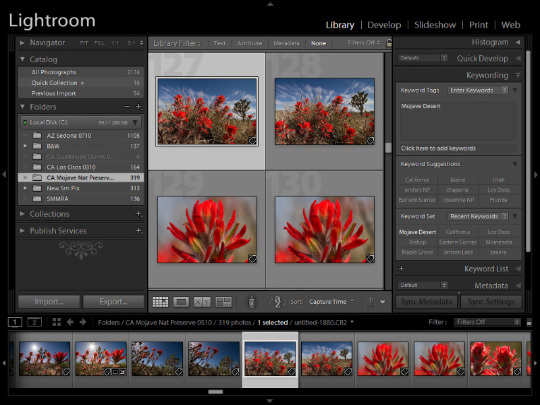 The workflow applies to Lightroom 2 and 3, and includes commentary on Lightroom 3. Nature and nature photography have long been important to me. My long association with Outdoor Photographer really helped me both as a photographer and a communicator about both photography and nature photography. My education actually included both photography and nature, including degrees in Plant and Soil Science. So I have a new blog devoted to nature and photography called, www.natureandphotography.com. 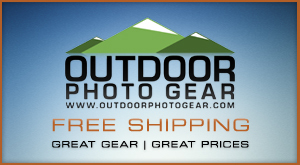 You’ll also find a post there about Lightroom and honoring nature. 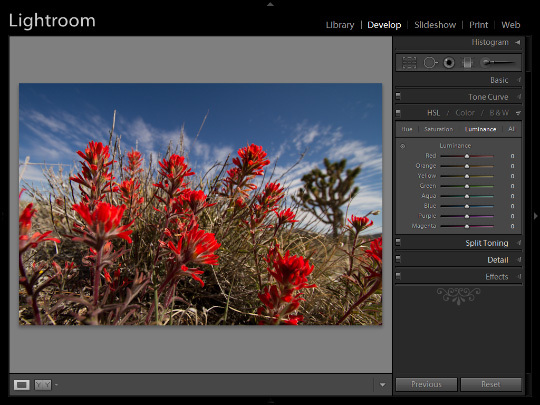 Some great advice in here, I’m trying to streamline my lightroom editing process as much as possible. I’d love to see your lightroom workflow to see how you sort through and edit photo’s after a shoot – always interesting. Is there a way I can change the key combinations so I can assign the keys to each of the LR functions or options…? Sorry, not that I am aware.